Great reviews for this spacious family friendly apartment in the centre of the pretty little market town of Bakewell in the heart of the Peak District. Sleeps 1 - 7 persons and has a full sized cot for an infant. 3 bedrooms, which includes a double room with private ensuite, and also has a large family bathroom with bath and separate shower cubicle. Fitted kitchen with washer/dryer and spacious lounge with large comfy sofa and dining area seating 7 persons. Free use of cot, high chair and baby gate. Large apartment over 2 floors with private rear entrance through our outdoor courtyard. Floor 1 - fitted kitchen including fridge freezer, washer/dryer, electric double oven. Lounge/dining room - comfortable corner cushioned sofa. Dresser, electric stove and storage heaters. Large dining table with seating for 7 persons and High chair. Long hall way leads to a very large family bathroom with bath, w.c And separate shower cubicle. 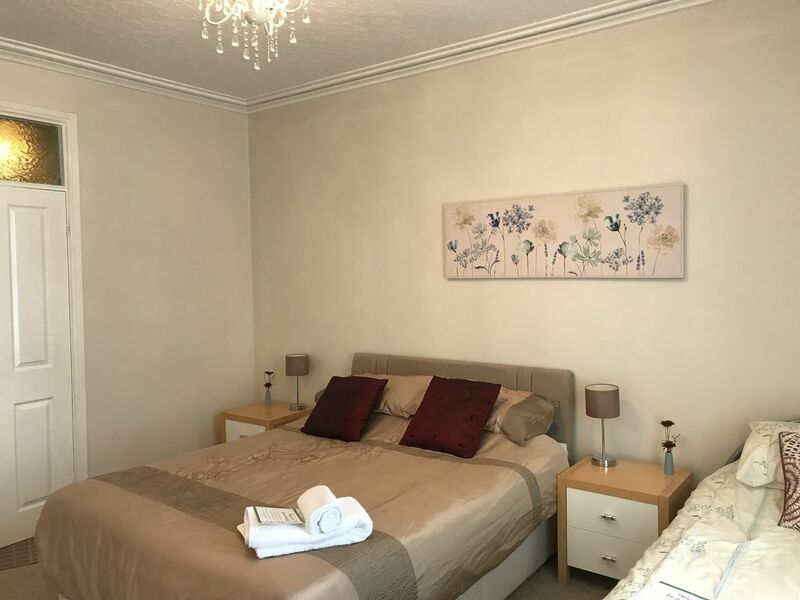 Bedroom 1 (large family bedroom) - king sized bed and single bed , full sized cot if required (no extra cost), 2 bed side tables, chest of drawers and hanging area TV with free view. Hairdryer iron & ironing board. Bedroom 3 - double bed, chest of drawers, bedside table, TV, wall heater and beautiful ornate fireplace leading to spacious private en suite with shower cubicle, sink and wc. Hair dryers, iron and ironing board, clean bedding and towels and heating all provided. For your arrival - milk, sugar, tea, coffee, biscuits, bottled water, cold drinks and Bakewell Tart with our compliments. One free private car parking space available With booking, key entry fob and car parking space number provided in arrival. If extra spaces are required these Can be booked before arrival at £3.00 Per space per night. Owner of the Bakewell tart shop & coffee House, a small family Business. I am married with 2 children and 4 grandchildren. I work in the Business with my husband and daughter. We love working in the shop and have some lovely customers many returning daily, weekly monthly and every year, meeting our customers and guests and providing a great service is the best part of the job. You must try our delicious Bakewell Tarts. We bought the business in 2001 with accommodation but chose to live In our existing home, about 4 years ago we decided that we could offer some nice comfortable accommodation for visitors travelling to the Peak District to stay with us and enjoy the lovely countryside. It is like home from home. busy during the day as you would expect in a market town, but during the evening so peaceful. an ideal location for walking, sightseeing and relaxing, there is something for every age group to enjoy. I feel very privileged to work I such a lovely picturesque part of the world. The apartment is exceptionally spacious ideal for family holidays and so close to everything, you can walk everywhere if you want to, it's all on your doorstep. just use the car to visit all the historic stately homes such as Chatsworth house and Haddon hall. there are so many attractions to visit, it is a walkers paradise, but should you choose to just sit and watch the world go by the you can. local buses run daily to Chatsworth House and Haddon Hall,Buxton, Manchester, Matlock, Derby and Nottingham through all the picturesque villages. some services are seasonal ( best check first). One thing we do have is space, it's great for the kids and if there are more than one family as there are two levels. If you do to want to cook you can just walk downstairs and we can provide breakfast and lunch at discounted prices. Storage Heaters & wall heaters. Clean bedding and linen provided Bottom sheet and fleece blanket available for cot, it is recommended you bring your owned preferred top sheet and duvet. One free private secured parking space available your car parking space number will be allocated in arrival. Additional spaces can be booked in advance at £3.00 per night. Tea bags, coffee, sugar, biscuits, bottled water and milk are provided for your arrival . Any other desired brands would need to be brought with you. Plenty of crockery & cutlery, pans, frying pan If you require any special cookware to suit dietary needs or allergy requirements please speak to the owner who may be able to accommodate your needs. Assortment of adult and some child games available. If the guest is able to climb the stairs to the entrance of the flat, all facilities are accessible on the 1st floor. Notes on accommodation: The accommodation is well above average sized and therefore ideal for families, groups & couples. One family bathroom and an ensuite on the second in the double bedroom which allows privacy if 2 families. We have night storage heating an electric stove in the lounge, wall heaters in The bedrooms and portable heating is available during winter if required. A separate entrance is available at the rear of the shop to the apartment. One free secure car parking bay is available, a key fob to gain access to and from the car park is provided on arrival. If there is more than one vehicle arrangements can be made for additional parking for a small fee. Complimentary for all guests on arrival are tea, coffee, milk, sugar, biscuits,bottled water, butter and Bakewell tart are provided to start off your holiday. Outside: There is a courtyard outside the entrance but this is access for our outdoor seating area for our coffee shop during summer months Clean towels and linen provided, property is self catering and is not cleaned whilst guests are staying with us. If you are staying for more than 7 nights arrangements can be made for a changeover and cleaning if required. Great accommodation, extremely clean and spacious with a superb location in the heart of Bakewell - ideal for touring the Peak District. Definitely recommended! Lovely place to stay with plenty of space. We were a party of 7 so were at full capacity but the place still felt very spacious and had everything we needed. Comfy beds, warm house and plenty of hot water. Great central location- at at a fantastic price! Spacious rooms, and a very nice living area. Everything is very clean, and all the facilities up to a high standard. Overall, lovely place, and would definitely come back! Great apartment, warm , spacious and very comfortable. Brilliant location. Very much enjoyed our stay. We know and like Bakewell. Would stay at this apartment again. Only slight downside ---- kitchen could do with a little upgrading. Property was spotless and lots of little extras made our stay even better. Would definitely stay again. We are on the A6 Buxton to Matlock road, easy access from the M1 junction 28. Very good bus service available, bus stops just along the street to and from Buxton, Matlock, Chesterfield and Sheffield and local villages. East Midlands airport 45 minutes Manchester 1 hour 15 mins. Chatsworth house around 10 minutes, Haddon hall 3 minutes, Monsal trail great for cycling and walking join the trail just outside Bakewell about a 10 minute walk. Weekly market on Monday, farmers market last Saturday of every month all about 3 minutes walk. local Co-op and spar supermarkets, lots of lovely streets full of quirky shops and courtyards. Pubs and restaurants , Chinese, Indian, Italian, tea rooms, coffee shops. Swimming pool, library, lovely park with play and splash area for young children . Nat West Bank, HSBC, RBS and Lloyd's Bank. Larger towns nearby with everything what major towns and cities offer. Booking Notes: please call Zoe McBurnie to check availablilty, 20% deposit required on booking by card payment or cheque, the balance due 6 weeks before arrival. booking form sent out with receipt and returned before arrival. Extra car parking spacers to be booked before arrival. Deposits are not refundable. arrival after 3.00 pm if later than 5pm then we must be made aware so we can make arrangements for a key to be collected . Departure by 10 am Changeover Day: This is flexible except during school holidays when it is Saturday to Saturday Minimum stay 3 nights. arrival after 3.00 pm departure by 10 am If a late arrival is expected then prior arrangements must be made to collect the key Notes on prices: please call 01629 814692 to check for special offers and late deals.